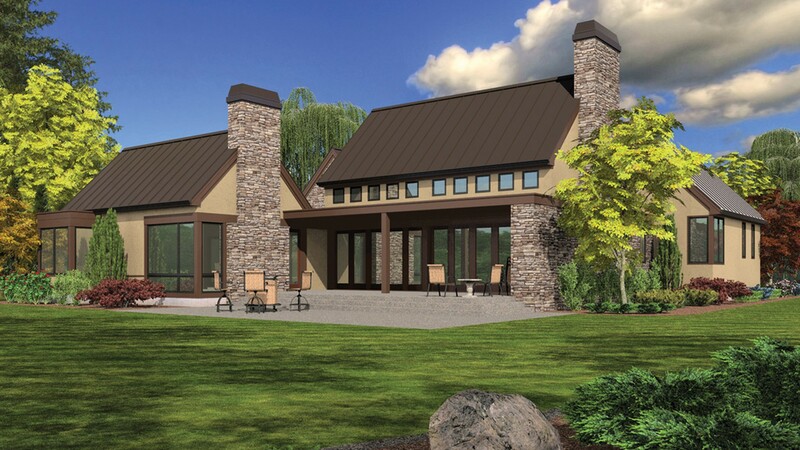 If you’re looking for a house plan with open interior spaces that reflect the wide-open spaces outdoors, the Saxon is an excellent choice. This is a Farmhouse-style design with a modern twist. Plenty of large windows along with an innovative layout give you endless ways to create scenic views with your landscape. 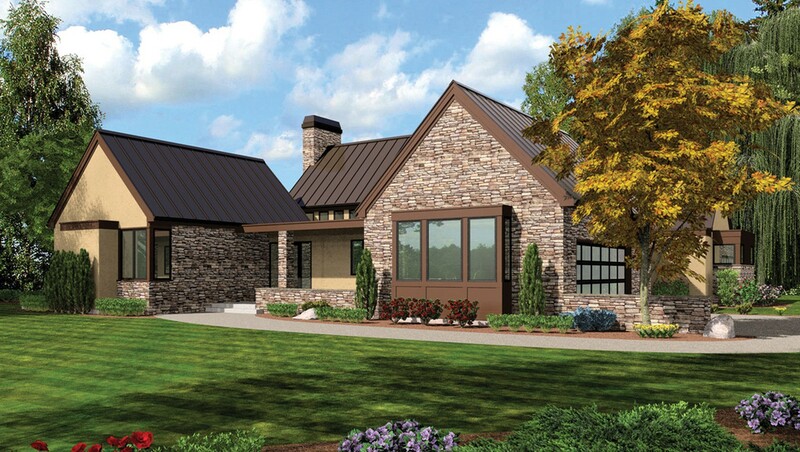 With a stone and stucco exterior, the Saxon blends the more traditional farmhouse theme with hints of European luxury. As you approach, the Saxon greets you with a gorgeous walled front porch that gives you a sheltered, private place to enjoy a lazy afternoon. Through the front entrance, you’ll find a spacious foyer with an archway that opens into a corridor where you can access two of the home’s bedrooms and a half bath. The foyer leads you to the home’s massive grand hall. In this space, you’ll have room for both a living and dining area – perfect for entertaining guests or spending time with your family. A wall of windows along the back of the grand hall overlooks the back porch and your beautiful landscape. The kitchen is situated between the Saxon’s front porch and the grand hall. With a smart three-walled design and central island, this kitchen is large enough to accommodate all the amenities you need, but compact enough to make cooking and cleaning easy. The range, sink and refrigerator are within arm’s reach of the island, which means you’ll never need to waste energy carrying pots, pans or containers of food across the kitchen. From the home’s dining area, you can enter a small corridor that features yet more conveniences. In this corridor, you’ll have access to the two-car garage, the pantry, a hall closet and the home’s utility room. Within the utility room, you’ll find the washer and dryer, a utility sink and countertops for folding laundry. A small closet in this room helps you keep linens and laundry supplies organized. At the opposite end of the dining area is another corridor that opens into the study and the master suite. 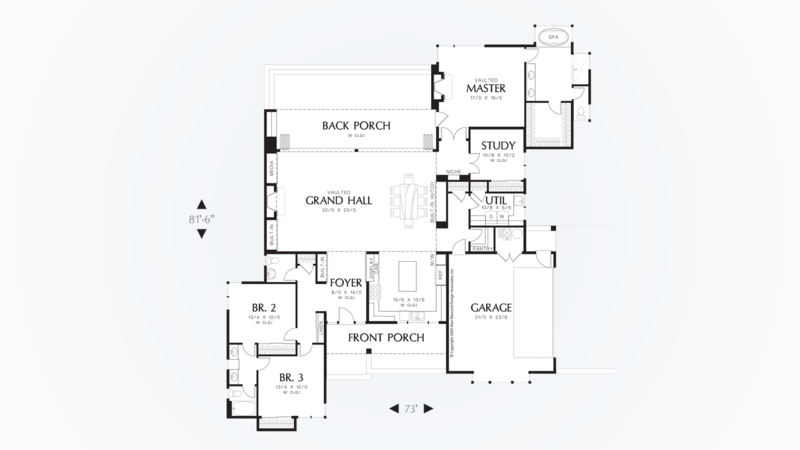 The master bedroom has its own entrance onto the back porch and large windows along the rear wall. In between the doorway to the porch and the windows is a large fireplace that will fill your evenings with warmth and comfort. Within the master bathroom, the luxuries continue. It starts with a spa tub that sits in its own alcove along the rear wall of the home. Windows all around the tub give you an amazing connection to the outdoors as you enjoy a relaxing soak. There is also a large, naturally lit tiled shower, a secluded toilet area and a dual sink. Just off the bathroom, a walk-in closet puts clothing, accessories and linens within easy reach.